Assuming this referrer is truly from Scansafe. I don't know how this Scansafe works, are they trying (or their client) or have they blocked that page for some reason? If so, for what? And I can't find a way to check up on their website. By the way, their website has a big chuck Flash. Because it is a referrer, therefore someone must be viewing that page and its URL is that looooooooooooooong. 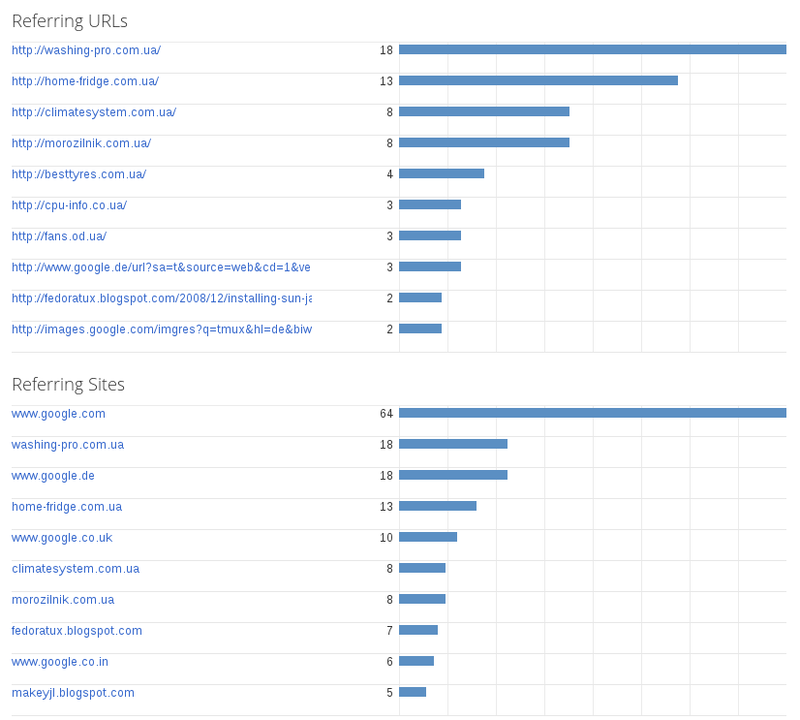 Only a few days ago, I posted about not so good URLs, Google Search's is long, but this Scansafe's is a real champion. I have to mask portions of the screenshot, I didn't try to decrypt it, but someone maybe want to and they maybe own malicious websites, which certainly will be qualified dangerous website and whoever uses Scansafe will check out. It is like reverse-honeypot. That cryptic long text may contain encrypted sensitive information or not, but I will guess it does not. You hardly will see URL mis-include sensitive information nowadays. There is one more thing is strange, that is HTTP. I think HTTPS will not be sent in referrer header. I am not sure about this, never thought about this part, have to check the spec. or something. Anyway, Scansafe is a security product, then how come it is only a HTTP connection when a client needs to be ensured with the maximal security while they are using Scansafe website? 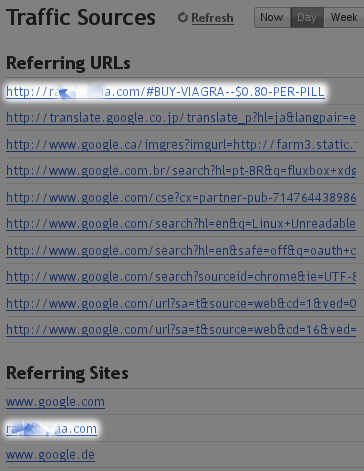 Of course, the stuff above is assuming the referrer is legitimate. What if it is not, it is bogus? Then the question is who sent that and why. If it was sent by Scansafe for whatever testing or checking purpose, then they become bad bots; if it was sent by someone else, then what's the purpose to impersonate Scansafe? Which I don't have an answer for that. But it doesn't seem to be enough for me. They always seem to be missing some links from those methods, the Alerts hasn't even got me anything for a long time. It is a list of external links which has links to your site. Since it is long, there is no humanly way to know which are new links. So, I wrote a simple Bash script to do the job, run it with CSV files as arguments. You can run it with CSV files of different websites, it has no problem with that. 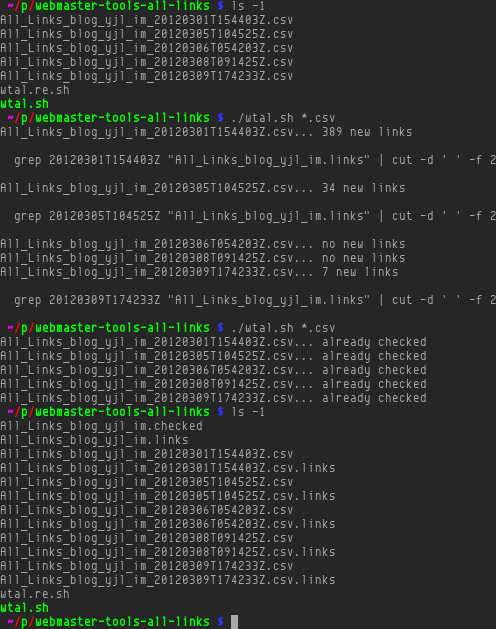 Once the CSV files are processed, they are safe to remove. You only need to keep the first two files in the last file list in the screenshot above. This script has a few predefined regular expression to filter out some common duplicate URLs, such as WordPress's and Blogger's archive or index-like pages. You really want to see is the posts which has link to your website in its content. I just spent around 30 minutes to click on profiles on Google Plus, trying to find some profiles who has Blogger blogs listed in Contributor to section. But I can't find one, even Blogger's Plus. 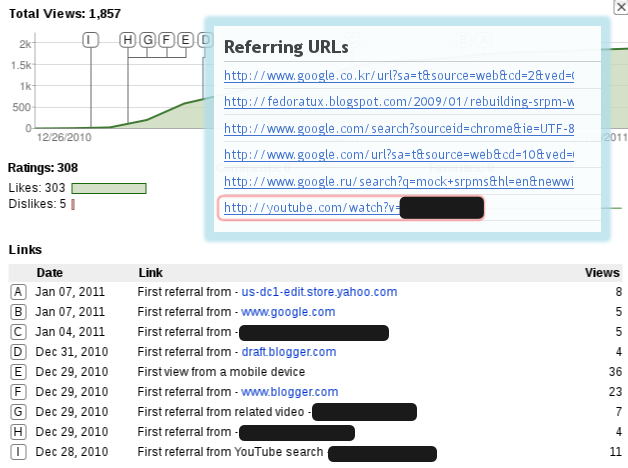 I have been seeing a few traffic from Google Plus (http://plus.url.google.com/...) and the URL link attached to that referral link is FeedBurner's. So, it's clear to me someone was able to click a link from my blog's feed on Google Plus. But I have never posted my blog posts on Plus when I published a new post, so it can't be me, can it? And that might not be a link via FeedBurner but a direct link, not sure what Blogger will put in the Plus post for the blog post link. Anyway, it's not me after 30 minutes of trying to find a profile. I was thinking to add a profile to a circle (follow? ), so I can see what it is, well, actually, I have no idea anything about Plus. I just want to reproduce by finding a profile like mine. I didn't find one, but finally I realized that I could just search for the post title, then I found the source. It was someone who shared via Google Reader. Duh, all mysteries are solved at once. Google Reader uses my FeedBurner feed and it can post on Plus when you want to share, which I stop using because I don't want to share on Plus. I used to add my comments, but since Google started pushing and squeezing everything of Google into that 4-letter word P-L-U-S, I don't like doing so any more. So, what does this post tell you? I wasted 30 minutes on clicking profiles. You just wasted 3 minutes on reading this post. A few days ago, I was sarcastic about .ua is free. Today, I still saw the same. I sent a feedback to Blogger via that gear icon on top-right corner. By the way, the feedback functionality is awesome. You can grab a region for screenshot. I wish Blogger had put in more time and effort to deal with spams before then added this awesome feature. I also noticed one of top posts is Fake referrers invade Blogger Stats, make great sense, doesn't it? That post was posted almost one year ago, so when the Stats was released, and the spam issue is still here. If I may say, it only gets worse. When I posted that, I only got one or a couple every a while. But now, it happens in every hour. The statistics is filled with fakes, I have learned long ago, never trust what Blogger Stats gives to you. That number is not what you think, that's visits from real human or legit bots. That's why I said "not accurate" in title. Please send a feedback or post to their help forum. If you also know any existing threads about this issue, post a link, I will go to thumb up. Hopefully, Blogger will take it seriously then. The day before yesterday, I saw about a dozen hits in Woopra on this blog. It's easy to guess that all are faked. It's no way to have same path, the navigation bar of Blogger.com, within 45 minutes. Amazingly, the faker can poke from so many different places and I think those are compromised computers. It's interesting to see no any reports from Google Analytics. I wonder if Analytics already wiped those fake attempts out or it was just broken?